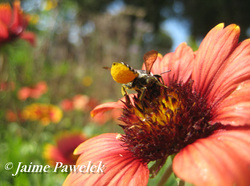 Florida is home to roughly 315 species of native bees, of which 29 of those are endemic (found only in Florida). The 300+ bee species can be found in six different bee families including Halictidae, Megachilidae, Andrenidae, Apidae, Colletidae, and Melittidae, and include 48 genera. 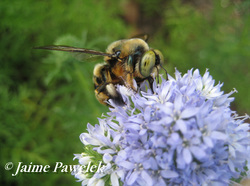 North America is home to over 4,000 bee species and worldwide there are over 20,000 species of bees! The sweat bees include a diverse group of colorful, small bees, many of which are so small that most people don't even realize they are bees! The leaf-cutting bees are an interesting group not only by the way they collect their pollen, but also how they build their nests. 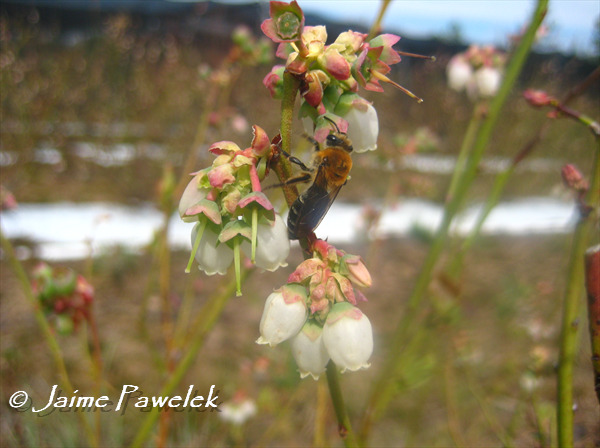 This diverse group of bees includes the non-native honey bee, as well as many other interesting native bees, especially those fuzzy bumble bees and woodboring carpenter bees. These ground nesting bees can be found mostly on early spring flowering plants and can sometimes be found nesting in aggregations. Plasterer bees get their name for the cellophane-like secretion they use to line and waterproof the walls of their nest with. This small family of bees is represented by only two species in Florida.